The online gambling operation that’s as cold as ice is bringing you hot betting action and huge bonuses. The BetDSI Casino has firmly set the bar for “best operator in the USA” and players can’t get enough of them. The “Blue Diamond Boys” are back with their trademark logo and icy blue website design, letting you know that they’re as cool as a cucumber and twice as tasty. Widely known amongst gambling experts as the “Best Sportsbook in Costa Rica”, they’ve been making bettors happy for years with their great service and awesome promotions. They’ve accepted U.S. residents from the get-go, and they even let those sneaky Canadians up north play with them. They’re literally a one-stop shop for anyone who likes to spread their bankrolls around to blackjack and roulette, NFL and NBA gambling, and the occasional racebook wager or two. They have an insanely long list of contests and promotions all year long so there’s always something to sink your teeth into. 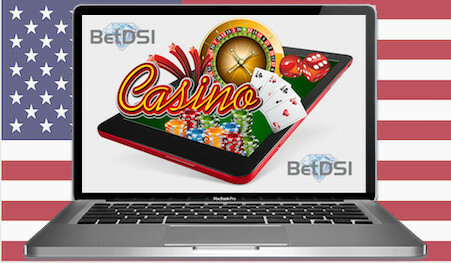 This exclusive review of the BetDSI Casino will lay out exactly what you need to know before deciding to give them your bankroll, and all of the important details that you should consider. There are two great welcome offers at the BetDSI Casino and both of them give you a nice 100% Match Bonus up to $1,000 on your first real money deposit with them. The first is a straight up casino bonus that can be used on any of their table games or slot machines, while the second is split 50/50 on their casino and sportsbook, allowing you to get free play in both channels. You simply pick whichever one is best for you and you’re good to go. One of the nicest free offers out there is the BetDSI Streak Challenge which doesn’t even require you to wager your own money to qualify for it. Simply make a deposit of any amount and start submitting your picks. It’s super easy to play, just go to the “Today’s Picks” page and make your selection of who you think will win from the featured matchups provided. If they win you get a point and if they lose your total gets knocked back down to zero. If you get 5 picks right in a row you win $25 in Free Play, 9 wins $100, 13 wins $500, 17 wins $2,500, and if you’re able to hit a streak of 21 wins in a row they’ll hand you $25,000 in cold, hard cash. Now that’s a nice little payday. On top of all that, from the second you sign up and deposit with BetDSI you’ll be enrolled in their Rewards Program that will automatically give you points on every wager. You’ll then work your wary through the Gold, Platinum, and Diamond reward levels, getting more perks, advantages, and freebies as you go. You’d better be ready for action when you open an account with these guys because they have two unique casinos full of your favorite games like roulette, Red Dog, Sic Bo, and blackjack, as well as a massive sportsbook with lines on the NFL, NBA, NCAA, MLB and much more, and tons of unique contests. The BetDSI Sportsbook is so big that it includes eSports, which are video game tournaments from around the world. You can even bet on politics and specific events like, “Who will Donald Trump fire next?“. They’ve started to offer NFL Survivor Pools so you can get in on the same type of fun stuff that you do with your friends. The Sharp Survivor contest will give the last man standing a huge cash prize, which is winner-take-all with no awards for the runners-up. There’s also the Bet the Board contest where you pick every game for the 17 weeks of the NFL season and get a point for every time you’re right. Then at the end of the season whoever is atop the leader board gets prizes. In addition, they offer Office Pool Squares which is a board just like the one at the last Super Bowl party you went to, and Bracket Challenges which are your classic March Madness bracket-busters. If you can think of a fun sports pool that you’ve ever played, you’ll find it at this place. Anyone wanting to join a contest that’s searching for “the worlds greatest NFL handicapper” can join the BetDSI Cappers Cup and pick 5 games against the spread each week. Again, you get one point every time you pick correctly and then whoever has the most points at the end of the season wins the crown. Oh, there’s also the BetDSI Racebook which accepts wagers on every major North American track, and they even give you daily rebates of up to 8% on exotic wagers and 3% on straights. Like all of the best USA online casinos, BetDSI accepts every major credit card such as VISA and MasterCard, and you can even do it over the phone, which is pretty rare these days. You’ll also have to contact their customer service team if you want to make a Person to Person transfer, but you can only use this method once every 7 days, which makes it a pretty clumsy way to move funds around in this day and age. When you visit their financial page you’ll see that they’re recommending cryptocurrencies like Bitcoin, Dash, and Ethereum, and there are many good reasons why. For starters, all of the transactions are totally confidential and there are no records with your name on them – good for anyone who likes to keep their transactions a secret from their significant other. Also, they’re lightning-fast which means you don’t have to wait around to play when you deposit, and you’ll immediately get paid whenever you request a payout. They give their players a little something extra by covering the fees on all deposits over $300 USD, regardless of the method used. This really comes in handy since there’s a $100 fee for Bank Drafts and a $35 fee for Person to Person transfers. However, it’s not all sunshine and rainbows in the BetDSI Finance Department and if you’ve deposited with a credit card but are requesting a payout via Bitcoin, they’re going to sting you with a fat charge of 10% of the requested withdrawal amount. Of course, the easy solution to this is just to deposit with Bitcoin in the first place. The maximum amounts for transfer are $650 by Western Union, $1,500 for VISA and MasterCard, and $50,000 for Check, Money Order, Bank Wire, or cryptocurrency, so high rollers thankfully have a few options available to them here. There currently isn’t a BetDSI Mobile App that allows you to download their casino directly onto your mobile device, however, you can access all of their products simply by loading up their website just like you would any other page on the internet. You can then easily scroll through their sportsbook and casino games as their entire site has been optimized to automatically detect your device and display itself perfectly on the screen. Sure there have been a few online casinos in the U.S. with troublesome mobile horse betting software, but you don’t need to worry about that here. You can flawlessly load their entire racebook on any smart phone or tablet computer and get your money down on as many races as you like. It’s absolutely fluid. With over 20 years in the business, the BetDSI Casino has learned exactly what players want and how to make them happy. After only a few minutes on their website it’s easy to see why they’re so popular with gamblers across the country, whether it’s their great bonuses, tons of contests, or generous rewards program. You’ll find every casino game imaginable and all of the greatest sports leagues from around the world. You can even bet on eSports, politics, and Hollywood happenings in their huge sportsbook, and if you ever have a question you can contact their customer support team 24 hours a day, 365 days of the year. It will only take a few moments to register and get your account up and running. Find out for yourself why they’re one of the top destinations for Americans today – you’ll be very glad that you did.